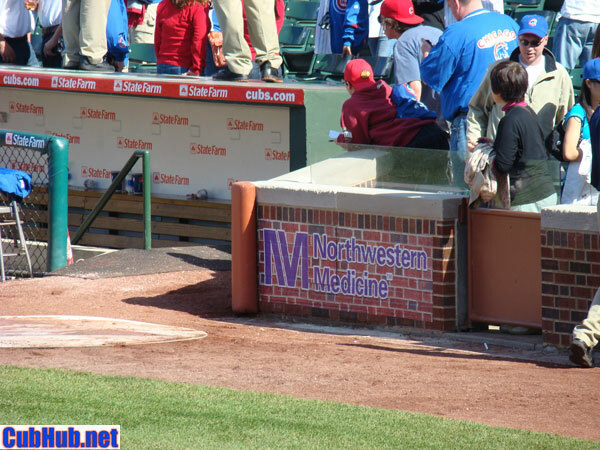 As promised by the Ricketts family, the Wrigley Field grounds, main concourse, and even restrooms were noticably clean. Gone was the grit and grime generally found throughout in recent years. I noticed plenty of fresh paint, most noticably the back of the scoreboard (facing Murphy’s Bleachers bar). 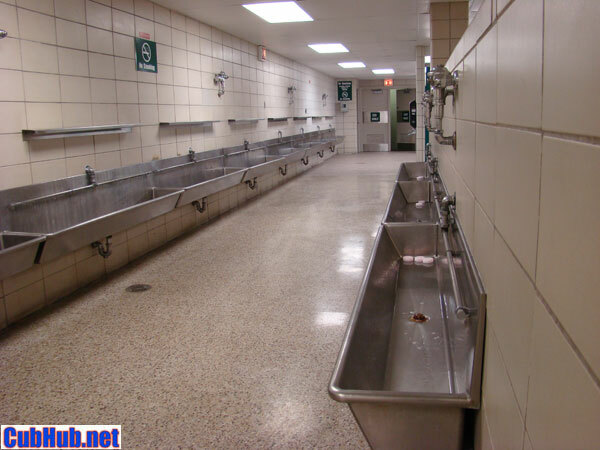 The famous trough urinals in the men’s restrooms were shiny clean. The floor was clean, the sinks were replaced, and there were 2 men tidying up during the game. I noted last year the bad suspended ceilings in the restroom were disgusting with dirt and stains. This year they are all new, with seemingly brighter lighting throughout. I was most impressed with the touchless anitbacterial gel dispensers at each end of the restrooms. Having hand santitizer is such a no-brainer but I don’t recall ever seeing these available at Wrigley Field in the past. There seemed to be plenty of friendly ushers, security personnel, and other customer service folks spaced around the inside of the park. I wouldn’t say their helpfulness or friendliness were over the top, but they certainly seemed available and willing to assist with any request. I went out of my way to find one of the new game day Ambassadors both inside and outside the park. I found no one that seemed to fit that description. The Cubs hired a Director of Fan Experiences, Jahaan Blake, to oversee the 25-30 ambassadors program but I could not find any. I wonder if the program is underway? Haven’t heard much about it since they brought in Jahaan and began the hiring process. Hmmm..
Consessions at Wrigley Field have always been marginal at best. In this one regard, I think our friends on the South Side have us beat. Generally there have been few healthy options available and none of it is a bargain. So as a fan it’s frustrating to have limited options and get charged top dollar for inferior food fare. 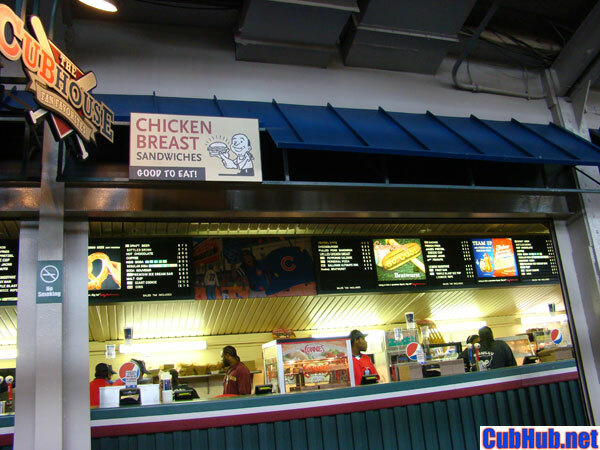 Not much has changed here yet, although Tom Ricketts made a point in many interviews to say he wants to upgrade the food choices at the ballpark. One notable addition is the bison dog and bison burger. I didn’t try either but I do wonder why bison and not, say, turkey as an alternative to hot dogs and hamburgers? With food, I would say the Ricketts family still has plenty of work to do here. For Chicago to be such a mecca of fabulous pizza, why do they serve such lousy pizza slices at Wrigley? It’s warmed over, not fresh, you can only get plain cheese or with sausage, and [gasp!] no thin crust options. They could bring in any number of local vendors to spice up the pizza options. Just an idea. For that matter, they could bring in some local beer brewers for some options there too. 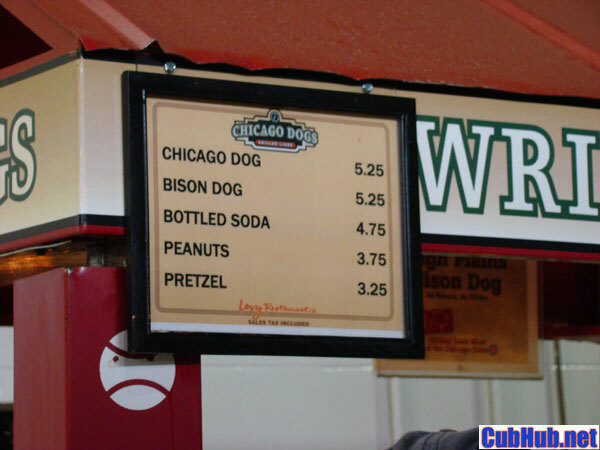 For someone trying to eat healthy or if they happen to be vegetarian, Wrigley Field offers very little. One holdover from the Tribune ownership of the Cubs is a 20% consessions discount for the first hour Wrigley Field is open each day. TIP: Get there early and take advantage of the discount – it makes the lousy food options that much easier to swallow. One of the early mantras of the Ricketts family was to tastefully find new revenue opportunities. While braced for the proposed Toyota sign to take over the left field bleachers, I’ve found the other new revenue streams to be far less offensive. There is a little more on-field marketing, but from what I saw, it seemed reasonable.